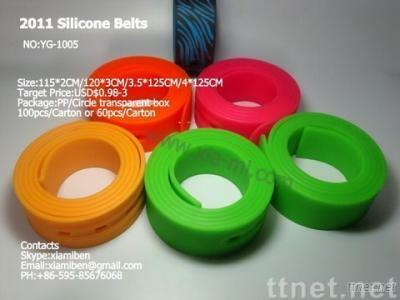 1)Material: Non-toxic, softly, eco-friendly silicone, 100% silicone suitable for men, women or kids. 2)Color: Except normal colours, it also can be made as your pantone colors 3)buckle: plastic/ally 4)Size: 115*2CM/120*3CM/3.5*125CM/4*125CM -four sizes and the length is adjustable, and you can release the buckle, cut the belt to your length and clip the buckle back. 5)Package: The method of packing can be changed according to customers' request; the information we did for you reference as below: 1pc/polybag, 10pcs/big poly bag, 100pcs/carton 1pc/ circle transparent box, 100pcs/carton 1pc/ rectangle transparent box, 60pcs/carton 6)Free design, Prompt reply and excellent service, high-quality with competitive price.